The highly anticipated Bollywood film Thugs Of Hindostan has been released within hours of its release today. 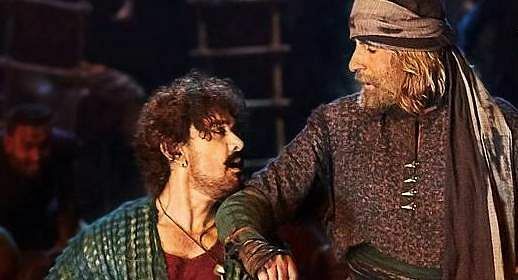 The film starring superstar Amitabh Bachchan and Aamir Khan was reportedly leaked by piracy website TamilRockers and it is said to be in HD quality. The film has been leaked in all three languages by the website, which has been known to undertake such stunts in the past. The film has received negative reviews even though it has some of the biggest stars of the Hindi film industry and while fans are disappointed, the leak by the website means, it will perform worse as viewers will not go to the cinema halls. However, movie buffs have written to the Tamil Film Producers Council (TFPC) to seek legal action against the piracy website. Within hours of the film’s release, due to the failure, there are several memes which are also circulating on the internet, as many users have expressed their displeasure as it failed to meet their expectations. Earlier, Aamir Khan’s appearance was also found to be similar to Jack Sparrow, played by Johnny Depp in the Pirates Of The Caribbean franchise, because of which the film was trolled. However, Aamir said that his character is far better and fans will see, on its release. Thugs Of Hindostan is based on Philip Meadows Taylor's 1839 novel Confessions of a Thug and has been directed by Vijay Krishna Acharya. Apart from Aamir and Amitabh, the film also stars Katrina Kaif, Fatima Sana Shaikh and Lloyd Owen.